After a short couple days back in Dallas, I was back at the airport heading to the next event. The life of a cyclocrosser, eh? This time I was heading to Pennsylvania for my first shot at racing Nittany Lion Cross in Trexlertown. Nittany used to be an early season staple on the UCI calendar, but took a year off during the 2017-18 season. This year, the event stacked up just before the first UCI World Cup of the season (in Waterloo, WI). Still, there was a strong field of riders hungry for an opportunity to gain some highly coveted UCI points. That’s a ‘Fresh Prince of Bel-Air’ reference, in case you missed it. I arrived in Philadelphia under gray skies and cooler, damp temps. I swooped up my mini-van (Pro Tip: always rent a mini-van… but just be sure to leave one for me!) and rolled up to Horsham, PA to meet my friend, Davek. Davek and I have been friends since we were 10 years old and I was excited to hang out with him over the weekend. After picking up my BikeFlights boxes at the local FedEx office, I met up with Davek and we went to grab some cheesesteaks. Perhaps a cheesesteak was not the best pre-pre-race nutrition, but it was DAMN good. Plus the steak has protein, and the cheese whiz provides caloric density, amiright? I took my time getting going on Friday but once I got bikes put together and groceries for the weekend, I hit up the local trail for some openers. 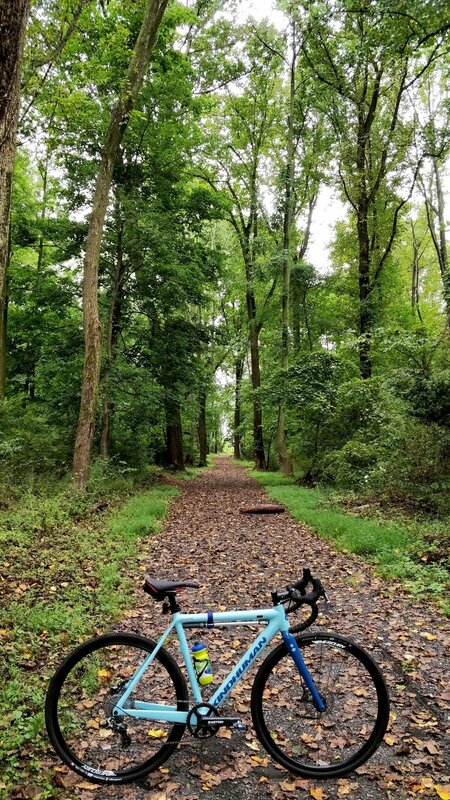 I’m always amazed at the bike infrastructure that exists around the country, and this path in Horsham was definitely awesome, providing a safe place to get outside. Openers done, I was feeling energized and ready to go. With my first weekend of UCI racing on tap, there was much to be excited about! I’ve only ever heard stories of Trexlertown, PA from friends who ride the track. T-Town as it is more commonly known, is the home of one of the best velodromes in the country. This outdoor track regularly attracts racers from all over as well as a host of local spectators. Settled in the Lehigh Valley, the course itself was relatively flat. There was use of an embankment, but a majority of the course was open pedaling sections with flat 180 turns, and one mud bog. 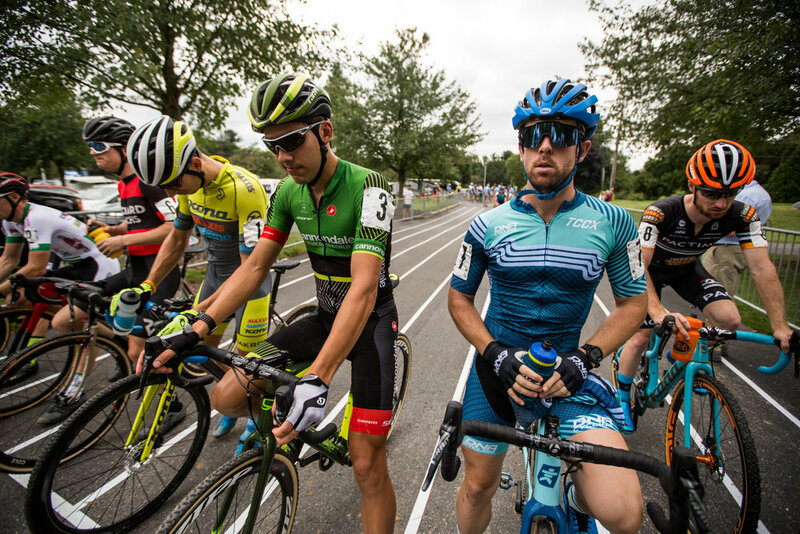 With few super technical features to break up the riders, the race would be more tactical and lend itself to pack racing over the course of 60-minutes. I was fortunate to get a good call up position on the front row (thank you UCI World Cup points!) of the grid. This was a FIRST for me and rather than racing from behind, I could focus on making the front group and actually RACE the race. As we awaited the start of the race, my nerves were building and I could feel my heart rate start to rise, poised and ready for the fight ahead. The whistle blew, I was quick in the pedal but chose to reserve myself a little bit so as not to start too hard. For me personally, I was not interested in taking the hole shot. Rather, I wanted to slot into a position to make the front group and sit on the back while others did the work. Through the first turns I slotted in about sixth or seventh wheel. I was feeling good and as we entered the first section of turns, I felt smooth. Mentally, I was in it. We dusted the stairs and the next section of turns, opening up a sprint across the field to the far end of the park before coming back to the main venue through the trees. With rain earlier in the week, the ground was still somewhat soft and it was definitely greasy in the woods. I was still riding well, holding my spot and not getting in over my head. We pedaled through the woods in single file and, in a moment of inattention, I slid out over a root on the drive-side of the bike. I got up and remounted quickly so as not to lose too many spots. Just then Al Donahue (JAM/ NCC) rolled past and whispered, “The outside line is smoother.” Thanks Coach! Now I was back in ninth. I wouldn’t say that panic set in, but there was definitely a sense of urgency that arose exiting the woods and seeing the lead group ride away with a few others in tow. I pushed hard on the pedals and set off to find the next group. Adam Myerson (Cycle-Smart) came with, as well as Greg Gunsalus (Richard Sachs CX). We carried on, working in unison to reel in those getting popped from the front group. As we crossed the line seeing five laps to go, I was feeling a bit anxious and impatient. I could see the group breaking apart at the front and I felt like I had the legs to get across. Entering the section of turns before the open field crossing, I moved to the front of the group and took a little dig to test the will and the legs of my chasing compatriots. As I made the turn for the open field, I heard a crash of bikes behind me and looked back to see Greg and Adam tangled on the ground. There was an unfortunate touch of wheels, but everyone was okay. I turned my focus to the course ahead of me and pushed harder. Five laps to go was a long ways, but I was now chasing in solo seventh and committed to the suffering at hand. “Smooth and flow,” I repeated to myself as I navigated the turning track in pursuit of the riders in front. It seemed to work as I felt like I was making time on the guys through the turns and flowing sections of the track. I measured my effort on the open pedaling sections and kept fighting my body to continue pushing on the pedals. 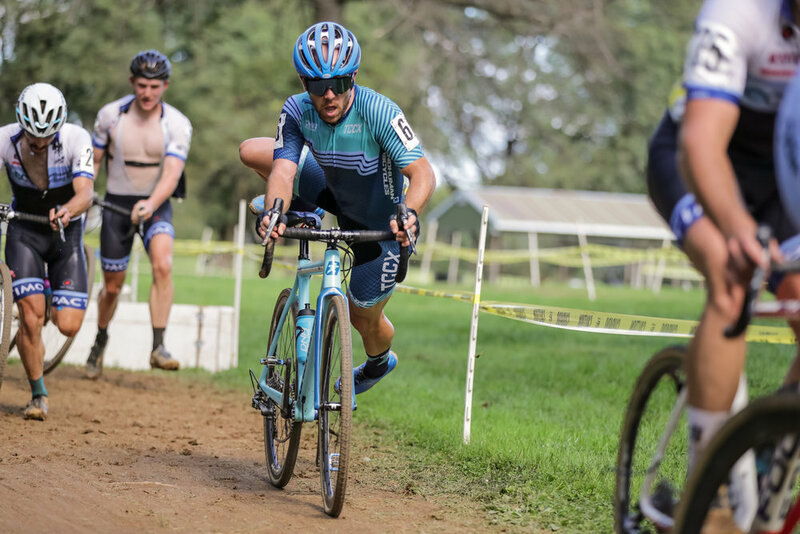 With two laps to go, I eventually caught Michael Owens (Richard Sachs CX), using his help to keep riding hard and make headway on the leaders. Sensing that I could go a little bit harder than the current pace, I took to the front just before the barriers. I sprinted as hard as I could over the VERY tall barriers and nailed the remount. Opening up a little bit of a gap, a second or two at best, I kept the pressure on to break away from Mike. 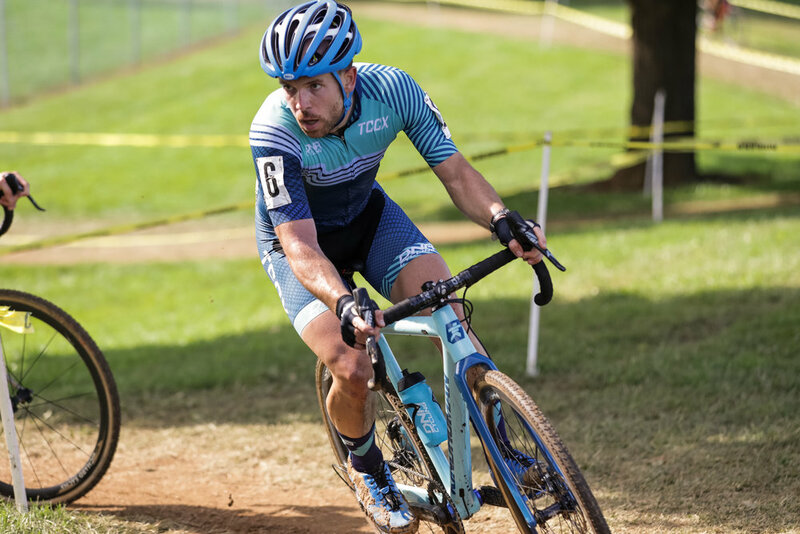 I opened up a gap and set my sights on chasing down Alex Ryan (Pactimo/Mock Orange CX). With just over a half lap to go, I got to Alex’s wheel and took a second to recover from the efforts. Again, I had this feeling that I could go just a little bit faster, and opened up the throttle before hitting the turns in the woods. I was now in fifth, looking ahead to run down fourth place. I was already in place to achieve my best UCI finish ever, but I wasn’t about to settle for fifth. I stuck to my mantra and was making headway in the chase, but the real estate ran out and I crossed the line in fifth. Not a bad way to start my UCI season. Collapsed on the ground gasping for air, I was spent. And satisfied. Of course, more patience in the race would have been good, but finishing on the wide angle podium was more than I hoped for and I was stoked on the result. Tired and stoked. I slept in a bit on Sunday and my body was tired as I pushed myself out of bed. I hoped that a breakfast of Kodiak Cakes would bring me back to life and give me some much needed energy. With so much course traffic on Saturday, Sunday’s track was much dryer and run in reverse. I got a few laps on course and was feeling alright about the changes and my tactical approach to the course. I was more nervous about the rising temps. Again, I was on the front row and the nerves were still the same. Taking a lesson from Saturday’s race, I decided to be a bit more patient today and find the right moment to lay down my cards. The official’s whistle blew and I fumbled to get into my pedals. Shuffled back a bit, I had to push hard to pick up a few spots as we barreled towards the first right hand corner. So much chopping and smashing of bars were occurring around me. I was able to stay out of trouble and slide in around 10th wheel as we ran through the bog for the first time. The pace was lined out over the first lap and a group of six went off the front. Sticking to my race plan, I stayed back in the group and allowed other riders to chase. In hindsight, I should have tested myself to go with the lead pack, but the heat dissuaded me from going all in at that moment. Settled into our chasing group, the pace was painfully slow at times. “You’re fine. Save your bullets. Ride smooth,” I repeated to myself. My friend Ian Geilar (JAM/ NCC) was growing frustrated with the lack of pace as well. As we rounded the course with five laps to go, Ian took the reins and put in a dig to get away. The group seemed content to let him roll and, while I knew it was a good time to go, I remained resolute in my approach to the race. “Be patient,” I thought. The laps ticked down and Ian was building his gap over our chasing group. In the meantime, I had taken to the front to line it out and thin the herd a bit. But I wasn’t quite ready to push all my chips in. Finally, with two to go, I went to the front to push the pace. The gap wasn’t much, but I was making some headway and clawing milliseconds with each passing meter. In the moment, I felt like I had the goods to pick off riders one-by-one. Little did I know, the outcome wouldn’t be quite as ideal as I hoped. (A) Keep smashing the pedals in hopes that it would dissuade them from chasing for the remaining half of a lap? (B) Sit up and let the chase catch me and try to play my cards at the finish? I chose option B (patience is good right?) and inserted myself in the group in fourth wheel. The last part of the lap is a blur, but for some reason I still felt like I had the pace to finish well. 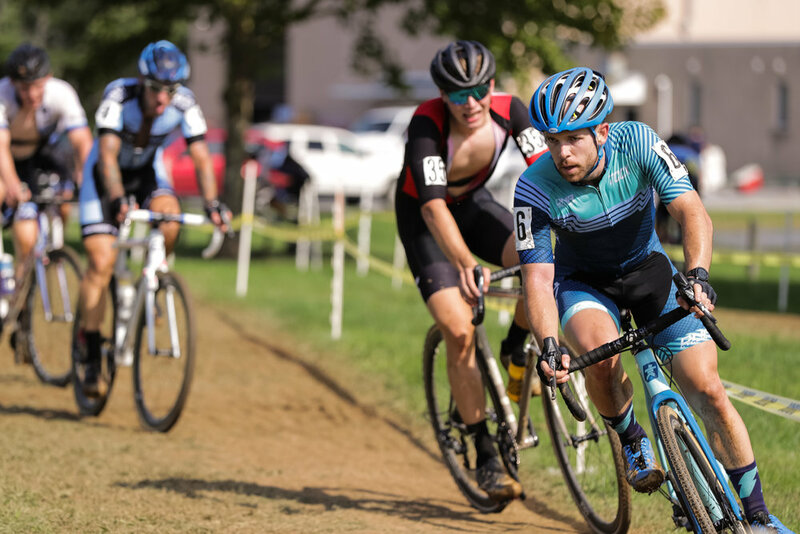 As we approached the final section of turns before the finish, Kale Wenczel (JAM/ NCC) came over top with Trent Blackburn (JAM/ NCC) on his wheel as if he was doing a crit leadout. I stood up to pedal hard, but with no place to pass through the turns, my last chance would be in the 75 meters before the line. Flicking through the gears, I mashed hard but couldn’t make up the two spots that I needed to slid into the top 10 and crossed the line in 12th. Looking back, there were moments where I could have (and should have) put myself out there. But on the day, the pendulum had swung from impatience and risk to the complete opposite of patience and optimism. Perhaps I let myself settle a bit after Saturday… or maybe I overthought the game on Sunday. Either way, I was dissatisfied with the result, but happy with parts of the effort. I set a goal for myself coming into the weekend to SEND IT and race with patience. I did both of those things and that is a positive. Now I can take my notebook of lessons from my first UCI race of the year, and get recovered before heading up to Iowa City for Jingle Cross in a few weeks’ time!